Hi I bought today a PowerEdge 2950 with 3 SAS 146Gb 15K and with PERC RAID , but I cant do a raid or use 2 of the HDD because their status is FOREIGN , I can use only one that is Online , how can I format or do something to 2 others HDD to make their status ONLINE so then I'm able to use them ? 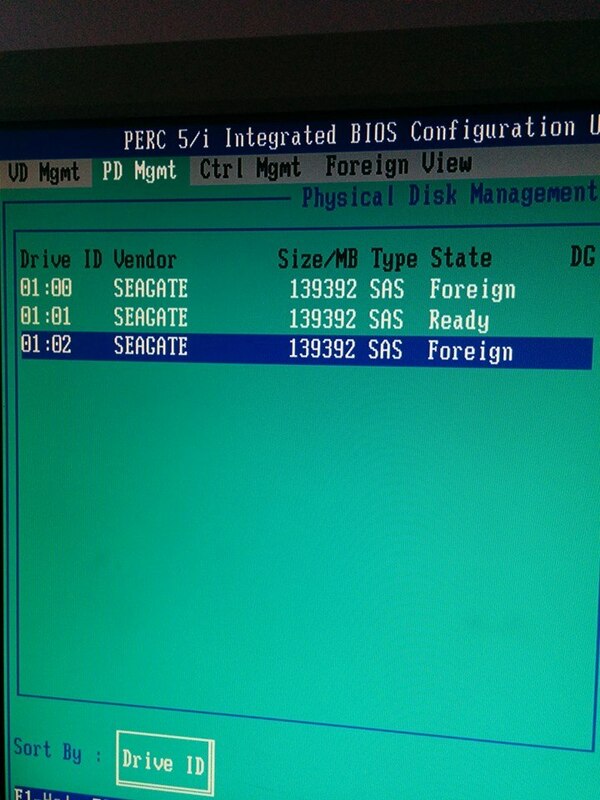 You can CLEAR the foreign configuration, then delete the existing virtual disks and create a new one. Clear it by highlighting the controller on the VD MGMT screen, F2, Foreign, Clear. That's not what I said. Go to the VD MGMT screen, not the PD MGMT screen.